Sawyer Water Filter Effectiveness Is Outstanding and, With Proper Usage and Maintenance, Compares Favorably to Other Filtering Methods. Sawyer water filter effectiveness is outstanding and compares favorably to biosand filters and other filtering methods. As with other filters, proper usage and maintenance are required for optimal removal of disease-causing pathogens. Sawyer filters exceed all EPA recommendations for filtering out a host of pathogenic bacteria and protozoa. Bacterial pathogens effectively removed from water include those that cause cholera, botulism, typhoid, and amoebic dysentery. As shown in Fig. 1, Sawyer filters also remove 100% of E. coli, coliform bacteria, streptococcus, and salmonella. Protozoan pathogens that are removed by Sawyer filters include giardia, cryptosporidium, and cyclospora. There are some precautions that must be taken in order to assure maximized effectiveness of Sawyer filters. Cloudy or turbid water should be pre-filtered, perhaps through a piece of cloth, in order to remove particulates that may clog the Sawyer filter. You can also let the water stand for one day or so, and then pour off the water from the top, leaving the sediment behind and filtering the cleaner water. You can put muddy water into the bucket to be filtered, but if you do you should clean the sawyer filter daily or after about every five gallons that you run through the filter. It is also recommended that, when using turbid water, that the hose be only about one foot long. This will prevent the hose from clogging and slowing the flow rate. Sawyer filters come with a backwash syringe, used to flush out the filter by forcing water backward through the filter element. These syringes are plastic and should not be stored in direct sunlight. Always keep the bucket of the filter covered, but not sealed tight. Contaminants can get into the water in the bucket before it flows through the filter, but the filter needs air pressure from the top of the bucket to force water through the filter element. Careful construction of the filter, which is quite simple, is important in order to avoid leaks. Never run anything through the filter except water you wish to drink. Sawyer filters are “cutting edge” and represent imaginative use of modern materials and technology. Biosand filters, on the other hand, have been around for ages and represent relatively simple and basic materials and technology. Both filtering methods have been shown to be effective in removing pathogens and preventing waterborne disease. The more appropriate filter to use in any particular situation depends on many factors. There are certain differences between Sawyer and biosand filters, however, that could really make or break your choice of which filter might be the best to use. 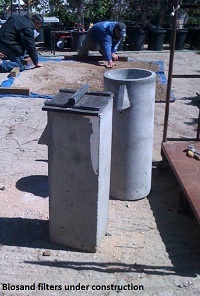 Biosand filters use materials that are often readily available locally. Biosand filters must be carefully constructed to be completely reliable. Not so, with Sawyer filters. The Sawyer water filter's simplicity is one of their greatest advantages. Another advantage is their faster flow rate. Biosand filters are a little bit slow compared to Sawyer filters. Biosand filters typically deliver about 25-50 liters of water per hour depending upon the filter design. Sawyer's reported flow rate is about 75 liters per hour. Both Sawyer filters and biosand filters can last for years and are easily maintained. If a biosand filter is used regularly and the “biolayer” is kept active by always being wet, the filter will provide clean water for many years. 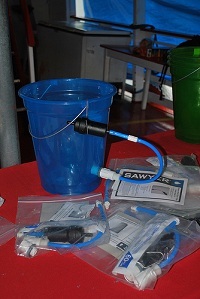 Sawyer filters can likewise operate for multiple years. If the filter dries out, it will still remain effective when water is again introduced. The biosand filter biolayer needs to be developed when a filter is first put together. The water that is first introduced into the filter may not be free of pathogens until the biolayer is fully established. Occasionally, and especially if turbid water is used, the filter must be cleaned. This is a little more difficult in a biosand filter than the back-flushing process used in a Sawyer filter, but still not too demanding. Both filters will do the job of providing clean, safe water. Sawyer filters are smaller, lighter, easier to build, easier to ship or transport, and can deliver large quantities of water very quickly. Biosand filters are larger and heavier, have a slower flow rate and are more difficult to build. The more complex nature of the materials, processes, and skills needed to construct biosand filters really lend themselves to the creation of jobs, markets, and community development. A biosand filter program is truly a community development program. The materials, skills, and labor can often be found locally. Sawyer filters don’t offer the same development opportunities. They are shipped almost complete, except for a 5 gallon bucket, and can be easily constructed by one person. As good as Sawyer filters are, if the materials for biosand filters are available, a community could benefit greatly from the additional market, labor, and development potential of a good biosand filter program. Obviously, there are places where materials for biosand filters are not available or members of the community simply need simple and reliable filters. In that case, another filter type would be more appropriate, and a Sawyer water filter may fit the bill perfectly. Return to "Intro. to Sawyer Water Filters" from "Sawyer Water Filter Effectiveness"